This presentation was prepared by Alony Hetz Properties and Investments Ltd. ("the Company"), and is intended solely for investors. It does not constitute an offer to purchase or sell securities of the Company or	an invitation to receive bids, as noted, and is intended solely to provide information. The information presented does not constitute a basis for reaching an investment decision, recommendation or opinion and is not a substitute for the investor's judgment. The contents of the presentation, in all that relates to an analysis of the operations of the Company and its investees, is merely a summary, and in order to obtain a complete picture of the Company's activities and the risks with which the Company contends, one should review the Company's shelf prospectus, its current reports, the directors' report and its financial statements that are reported through the MAGNA system ("the public information"). The information included in the presentation is similar to the public information and is not new information. However, the presentation includes data that are presented differently and/or edited. The information presented is not a substitute for the public information. Forecasts, assessments, estimates and data related to future events, whose materialization is not certain and is not under the control of the Company and its investees. The revenue forecast, NOI and FFO calculations for the year 2014, including the dividends forecast for the year 2014, the initiation and construction of projects, including projects in the energy renewable sector, are forward-looking information, as defined in Section 32A of the Securities Law, and such information is based solely on the subjective assessment of the Company, which was conducted in good faith, based on past experience and the professional know-how aggregated by the Company, based on facts and data related to the current state of the businesses of the Company and its investees, and on facts and macroeconomic data gathered by the Company from other sources, all as known to the Company when this presentation was prepared. The realization or non-realization of the forward-looking information will be impacted, inter alia, by risk factors that characterize the operations of the Company and its investees, and by developments in the economic and geopolitical environment (globally in general and in Israel in particular), and on the Company's operating results, could differ significantly that that provided in this presentation. Alony Hetz is focused on holdings that confer significant influence in leading income-producing real estate companies. The Group companies invest in income-producing properties in mature western markets, with thousands of diverse tenants, which generate regular, stable and long-term cash flows. The Group has a policy of conservative financial management, expressed in financial flexibility, deriving from maintaining a high level of unsecured properties, long-term average duration to maturity of financial liabilities, insistence on maintaining unutilized credit facilities and reasonable leverage ratios. Since the beginning of 2014, the Company and Amot raised capitaland debt totaling NIS 1.5 billion from banks and the Israeli capital market, while reducing interest rates and increasing the average duration to maturity of the financial debt. For 16 years, the Company has had a consistent policy for distribution of the quarterly dividend that is declared at the beginning of every year. Investment of NIS 105 million in the acquisition of shares and exercise of options of Amot. The Company committed to invest up to £75 million in Brockton Fund III. The Company intends to invest up to $73 million in Carr, in an issuance of rights planned for early 2015. Extension of the maturity date of the loans given by a foreign bank to January 2017, while reducing the interest rates. Exercise of options for debentures (Series H) in consideration for a total of NIS 127 million (Series H) at effective interest of 2.7%. In October, a three-year CHF 50 million non-recourse loan was received from a foreign bank at annual interest of LIBOR + 2%, against the furnishing of collateral valued at double the loan amount. Extension of a NIS 300 million credit facility from a bank in Israel until January 2018, while reducing the interest rate. The Company's debentures are rated "ilA1" positive outlook by Midroog and "ilA" stable outlook by Ma'alot. Financial debt of the Company as of November 2014, totaled NIS 3 billion (gross) and NIS 2.8 billion (net). The Company is in compliance with all the financial covenants of the debentures, credit facilities and bank loans. Equity as of September 2014 – NIS 3 billion. Since the beginning of 2014, Amot has raised NIS 135 million from the exercise of options. Amot owns 94 properties encompassing GLA of 944 thousand square meters, of which 663 thousand square meters of exclusive properties, at an occupancy rate of 93.4% for September 2014. Amot also has 3 projects in construction stages encompassing GLA of 70 thousand square meters and 5 land reserves in stages of planning and improvement. 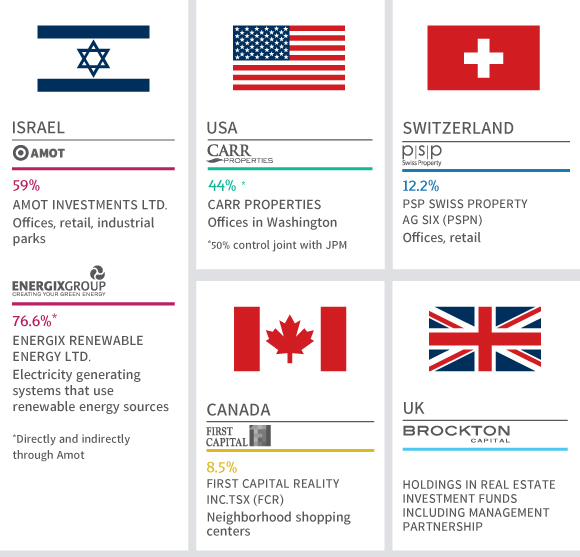 67% of the total value of Amot's properties are located in the Tel Aviv region. 70% of the investment properties (NIS 5.5 billion) are unsecured. As of September 2014, unutilized credit facilities totaling NIS 920 million, and net financial debt of NIS 4.2 billion with leverage of 53%. As a result of the issuance of debentures totaling NIS 242 million and refinancing a NIS 680 million bank loan, the average duration to maturity of Amot's weighted debt increased to 5.4 years (compared with 5.1 years in September 2013), and the weighted cost of the debt fell to 3.86% (compared with 4.28% in September 2013). Amot's debentures are rated "il-Aa3" stable outlook by Midroog and "il-AA" stable outlook by Maalot. Equity as of June 2014 – CHF 3.8 billion. 65% of the properties are offices; 59% of all the properties are located in Zurich. Occupancy rate as of September 2014 – 91%. Leverage percentage as of September 2014 – 29.1%. None of the properties are secured. Rated "A" by the Fitch international rating company. As of September 2014, PSP has unutilized credit facilities of CHF 580 million. PSP has no repayments to banks until early 2019. Interest coverage ratio of 7.7X. PSP initiated six projects with a total investment budget of CHF 460 million (of which there are four projects for construction of office buildings combined with retail space, hotels and residences, as well as two projects for massive renovation of properties in downtown Zurich). 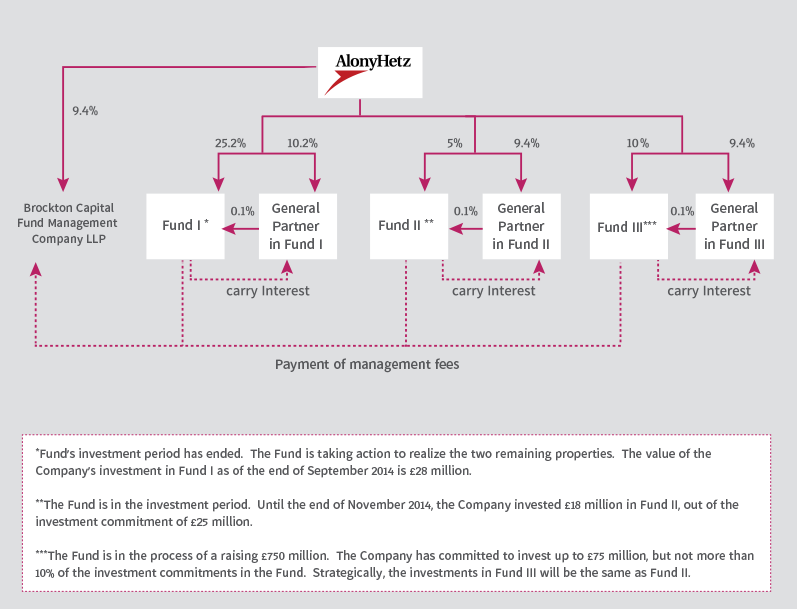 Alony-Hetz is the largest shareholder in PSP (12.2%) (second largest interested party holds 3.2%). Carr is a fully integrated company which invests and manages office buildings in metropolitan Washington D.C., located in key urban areas with close access to public transportation, and initiation and development of land in that region. Carr has full or partial ownership of 22 office buildings with rental space of approx. 300 thousand square meters, with a value of $1.3 billion. The properties are rented to hundreds of tenants. The occupancy rate in September 2014 was 83% and leasing rate was 90%. Carr also has 2 initiated projects for construction of office buildings with GLA of 28 thousand square meters, at a construction budget of $140 million. During the period, Carr has continued to improve the quality of its property portfolio, by improvement via massive renovation of existing buildings and the sale of properties in categories and locations that do not conform to its strategy. 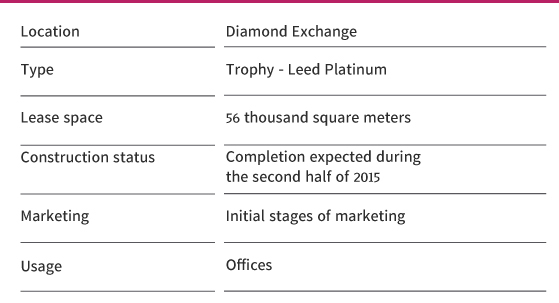 In November 2014, Carr completed construction (before fitouts) of a new office building with GLA of 20 thousand square meters, valued as of the end of September 2014 at $81 million. In November 2014, Carr signed a MOU to purchase oice buildings with GLA of 15,000 square meters, generating annual NOI of $6 million, in consideration for $89 million. The purchase is expected to close in early January 2015. In November 2014, Carr's board of directors resolved to raise $130 million in equity through an issuance of rights, which will enable it to purchase additional properties and initiate new projects, in order to expand its portfolio beyond $2 billion. As a REIT, Carr is obligated to distribute its profits for American tax purposes. In 2014, Carr will distribute a dividend that represents a 4% return on equity invested in the Company. The Company and JP Morgan have a joint control agreement, an equal stake (44%) in Carr and the majority in the board of directors of Carr. Carr's gross financial debt as of September 2014 totaled $574 million with a leverage percentage of 41%. The unutilized balance of the credit facility as of September 2014 amounted to $105 million. FCR is engaged in ownership, management and initiation of supermarket-anchored shopping centers in Canada. As of the end of September 2014, the value of FCR's income-producing real estate totaled CAD 7.6 billion. FCR plans investments of more than CAD 1 billion in the development of projects in the next 5 years. Total equity as of September 2014 – CAD 3.5 billion. Total unsecured assets as of September 2014 – CAD 5 billion. FCR is controlled by the Gazit Globe Group. Energix is engaged in the sale of electricity produced by photovoltaic solar energy systems and in development of wind-turbine fields. Energix is about to complete by the end of 2014 the construction work of Neot Hovav facility, with 37.5MWP output. As of September 2014, Energix has equity of NIS 181 million. Construction of wind energy projects and large photovoltaic systems (beyond the projects for which the financial closing has been approved for Energix to date) will require Energix to increase its equity.